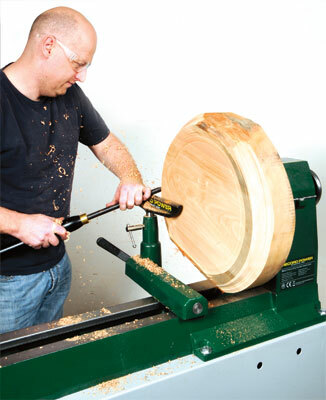 Mid-sized lathes, with a capacity of about 16-20in turning diameter over the bed, come in a variety of shapes and sizes and are items that many people aspire to owning. However, price, space and the other similar considerations will come into play before parting with your hard-earned cash. This Maxi-2 lathe from Record, an updated re-working of the old and much loved Woodfast lathe, is one that may well fit your requirements. At 270kg in weight and with a turning capacity over the bed of 510mm (20in) diameter, it is capable of handling some heavy-weight projects and the 11/4in x 8tpi thread coupled with a nice 2hp motor will certainly enable this to happen. 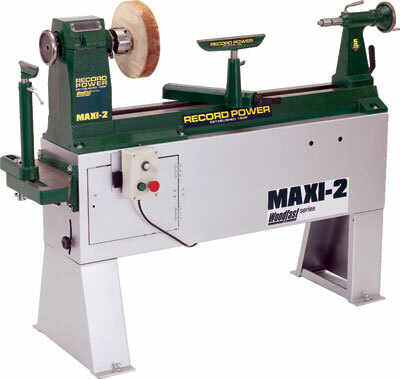 The lathe is a cast iron construction and the base unit is heavy-duty steel sheeting in a box-like construction. The Maxi-2 lathe is delivered to the customer on two separate pallets and one parcel. You will need help with these as all of them are heavy, and it took a pallet truck and Anthony Bailey and I to move the pallets and assemble the lathe. One pallet has the lathe base inclusive of motor, electronic inverter and variable speed control panel. The legs need to be attached to the main base body, again, the assembly process requires two able-bodied people to lift and fit everything. The other pallet has the lathe itself. The assembly was easy and took us both about 40 minutes in total. Once the legs and base were assembled the lathe is attached via bolts to the base assembly and just under the headstock there is a panel, and a release toggle - a really natty lever unit which releases or squeezes a rubber bung to expand or contract into a hole. This lever system is also used on the speed control box, which can be fitted near the headstock or tailstock. If you open this panel you will notice the un-connected wire, this is the electric unit that needs to be connected to the female equivalent from the headstock. When cutting off power to change belts, normally you will find a switch in the top of the headstock. 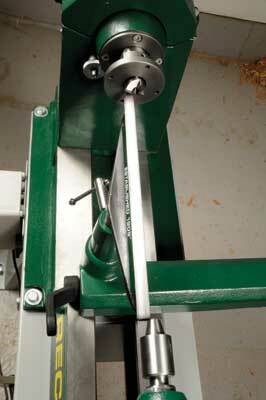 However, this lathe features one on the bottom panel, which presents great ease of use. The third package, a box, contains the outrigger for outboard turning. Again, easy to fit, but it is handy having someone else to hold it while attaching the bolts. On the headstock end of the base unit there is a twist knob, this locks/releases the motor to enable it to be lifted, so the belt can be changed. To do this, simply open the panel previously mentioned, lift up the motor and connect the belt to the relevant pulley. There are five in all. The top of the headstock lifts - after removing a security machine screw - to allow access to the pulleys located there. This also sports 24 tapered indexing points into which a tapered pin on the headstock can lock into them to stablilise work when carving, marking out and so on. In effect you have speed ranges, depending on the pulley chosen from 50rpm up to 3890rpm. This will give greater options for large or small work. The platter I was turning was running at about 80rpm and there seemed to be plenty of torque. The higher the speed for the smaller projects the less torque is needed. I like pulleys to be honest. The speed controller is one twist of the dial from minimum to maximum speed for that pulley used. So, if the right pulley is used this presents limited top-end speed limit. Imagine it was able to go form 50-3890 in one twist of the dial, and I was careless as I increased the speed. The large bowl blank would have gone airborne, with the lathe dancing around the room, probably leading to me being seriously injured. This is why I like pulleys to limit the speed range. Once assembled, the lathe bed etc will need a good wipe over with a cleaner to remove the light oil film protection. Once this is done, the lathe should be ready to plug in to the electric socket and ready for the off. Once assembled the headstock and tailstock (both featuring 2mt bores - the lathe is supplied with a heavy-duty faceplate, which acts as a thread protector too) a drive spur and a nice revolving ring centre were brought together for the 'kiss' test. They lined up perfectly. If they hadn't this would have involved undoing a few bolts underneath the headstock and adjusting until they align correctly. The tailstock and toolrest assembly all feature cam-lever locks for easy movement and are all robustly made. The headstock spindle and tailstock quill are also through-bored for lamp drilling and so on. The toolrest assembly has a moveable lower post to allow the shaft to be twisted so the locking unit for the rest can be moved to a position that is best for you or that does not foul the work. The lathe when working with the large platter performed without a fault. The legs needed adjusting a little to prevent rocking on our uneven floor - the bolts on the feet soon sorted this out. 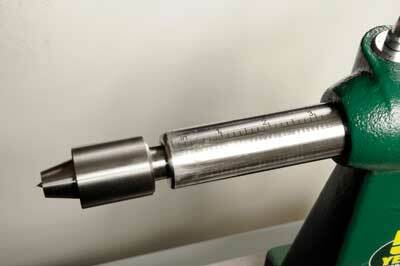 The mass of this lathe allows the Maxi-2 to be effective at dampening vibration. Heavy and light refining cuts were made with ease. I like the fact there are two positions for the speed control, which is good when working near the headstock or when hollowing or spindle turning near the tailstock. The tailstock and toolrest assembly lock firmly and are easy to move to a new position when needed. The maximum distance between centres is 975mm (38in) but with centres this is reduced a little, but is more than enough for spindles and table legs and so on. 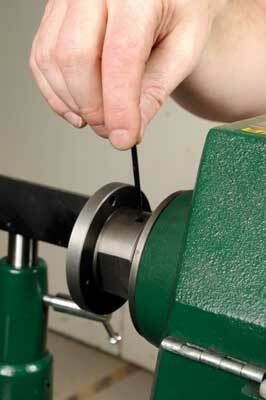 The toolrest is good in that it features a concave section under the part where the tools rest and for your fingers. The fingers being so close to the tool affords more control in use. The other wonderful thing about this lathe is that you can truly move the rest in so that you can get absolutely level with the centre of the lathe - great for fine spindle work. I found this lathe to be a delight to use. It is solidly built and well conceived in terms of how it fits together and how its functions. 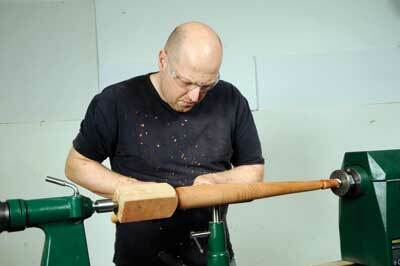 Like all things it really depends on how you turn and what you are looking for in a lathe. This one is certainly solid and capable of a wide variety of work. The mass of the Maxi-2 is, in my opinion, excellent and really does reinforce the fact that this lathe is well worth looking at when considering buying a good capacity machine. There is currently a special offer price on this lathe of £1999.95, which includes the Maxi-2 lathe, Super Nova chuck and outrigger. This is a very good package for a lot of lathe. "This one is certainly solid and capable of a wide variety of work"